Leh Nutrition Project (LNP) was the first local non-governmental organization (NGO) in Ladakh, established in 1979 by Save the Children Fund (UK) as a supplementary nutrition project in Leh District after initially responding to the needs of the rural communities. LNP moved towards the integrated approach and carried out number of development programmes that includes health, education, rural development and women's development. The focus of the organisation has always been centre on children, women and marginalized groups working to improve the socio-economic, education and health status of village communities. Livelihood project: Project aims to improve the livelihood of the rural population in the remote village in the ongoing transition period from an isolated subsistence agricultural system towards the integration in to monetary economy in harmony with the traditional farming practices. Farm based Livelihood development project: The project aims to improve the livelihoods of rural people through a multitude of land base and income generating initiatives to make traditional land based economy more remunerative. Promoting child Protection in Ladakh (PCPL): The project aims to promote Child rights to protection through facilitating and creating enabling environment in Leh district. Education: Aiming to ensure Children's rights to quality education and protection in the Leh District of Jammu and Kashmir State. Child Development Khazana (CDK): A life skills development programme, CDK aims to empower children and adolescents through imparting life skills of participation, leadership, decision-making, and financial literacy. Watershed development project: The objective of this programme is to improve the traditional distributory water channels of numerous villages by preventing leakages and regulating water management. They also aim to improve the ancient water reservoirs in the area by making them deeper, wider, leak-proof and by installing water-regulating valves and a lock system at their outlet. Artificial Glacier Technology: A technology dreamed up by Sh. Chewang Norphel of Leh Nutrition Project who subsequently received international and national recognition, including Padma Shri the fourth highest civilian awards for this innovative and cost-effective solution to a diminishing water supply is Artificial Glacier Technology. This technology encompasses solutions for most of the climate-change related issues for the rural population. "Student Educational Cultural Movement of Ladakh" (SECMOL) is a voluntary organization of working with Ladakhi youths in promoting development of Ladakh. It was founded in 1988 by some returning university students who realized the problems of incompatibility between modern education and oriental culture in the region. SECMOL aims to awaken people to the problems stemming from inappropriate and insensitive schooling leading to destructive development of Ladakh in cultural and social and environmental spheres. It aims to preserve and strengthen the traditional wisdom, cultural heritage and the unique identity of this land and the people. In order to realize this aim, SECMOL was established and the campus is 20 km from Leh, towards Srinagar. 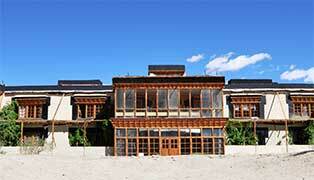 The campus has an organic farm with open learning space for the youths of Ladakh. It is active in conducting activities that include short and long term youth courses focusing on natural earth buildings, environmental education and awareness; and is a space to have interaction between visitors from around the world and with students from Ladakh, to gain cultural understandings of each other; and it is a learning space to discuss, deliberate, and understand the idea of sustainable development and to find solutions to the environmental challenges of Ladakh. Committed to create learning opportunities for each and every child of Ladakh, penetrating to the furthest remote village, in the harsh terrains of Ladakh where access to even better food is difficult, Ladakh@17000ft foundation is a holistic approach to drive attention of the world, to enable a way to better life for the people hailing from the remote villages of Ladakh. 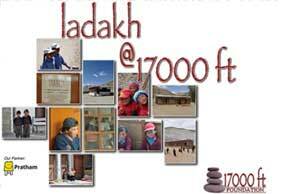 Ladakh@17000ft aims to strengthen rural villages and schools make them more acceptable to the locals and stem rural exodus of young families to far away cities in search of better life and directing attention to the local villages through increased volunteer involvement. Under their wide projects, they had designed, manufactured and set up classroom furniture for the entire schools and facilitated six week intensive teacher training courses to the locals. Their flagship project 'MapMySchool@17000ft' is an opportunity for travellers to learn about the rural schools on their route by assessing and geo-mapping all schools of Leh District, empowering all to contribute on such visits. The organisation core members are Sujata Sahu(Founder), Sandeep Sahu (Co Founder) and Dawa Jora (Director). 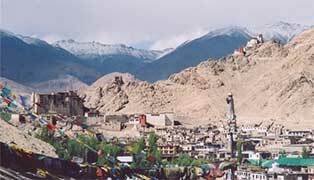 International Association for Ladakh Studies (IALS) is an interdisciplinary society studying all aspects of Ladakh. As part of promoting the constructive interaction between the international academic community and Ladakh's own scholarly community, IALS organizes seminars and conferences in Ladakh and abroad, including a biennial international conference. IALS also fosters the publication of research material on Ladakh, including conference proceedings and the regular publication of Ladakh Studies Journal. Ladakh Arts and Media Organisation is a public charitable trust established to articulate an alternative vision for the arts and media in Ladakh. 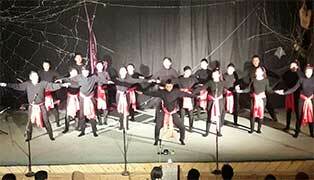 The organization set up LAMO Centre in Leh to provide a space for the understanding and development of the arts. The complex on which the Centre is located comprises two historical houses below the 17th century palace of Leh that were restored by LAMO and converted to an arts space with offices, galleries, a library, screening room, conference room, and open-air performance site. The centre is designed to carry out outreach programs, research, workshops, and exhibitions that showcase Ladakh’s material and visual culture, performing arts and literature. 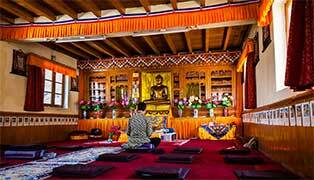 For further information LAMO Centre, P O Box 152, Below Namgyal Palace, Old Leh Town, Leh Ladakh – 194101. Ladakh Ecological Development Group was initiated in 1983 to Promote ecological and sustainable development, which blends with the traditional culture. The programmes include information, education, handicraft, agriculture and cultural preservation activities. Child Welfare Society Ladakh was founded in 1995 in order to serve poor student living in remote areas of Ladakh region irrespective of their race, caste and religion etc. Their educational aid and activities include sponsorship clothing facilities, English improvement courses and winter tuition. LTO was set up in 1995, by Mr. Mipham Otsal with an aim to foster development of theater arts in Ladakh and to renew the drama tradition of Ladakh. LTO has very successfully produced a variety of plays, ranging from the Hindu classic- Bharatandu Harish Chandra’s “Ander Nagari”, a Ladakhi adaptation of Anton Chekov’s “The proposal”, the dramatized version of very famous Buddhist Jatak-Kathas like Ithok Lhamo etc. Apart from the play production, LTO has conducted several theater workshops, Seminars on theater arts, children workshops, theater quiz and painting competitions etc. The Rural Development and you is a non- profit organization, of concerned Ladakhis, which works to overcome the problems faced by the rural people in their daily life. 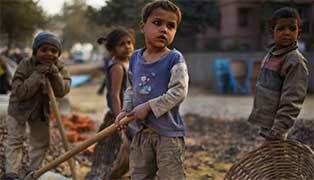 Participation, health, education and development programmes are organized to help and guide the rural people. The activities include seminar, training, workshops and interaction with rural people to understand their needs and problems. For further information contact: Director, LEHO, Himalaya Shopping Complex, Main Bazaar, Leh194101, Ladakh (India). Ladakh Heart Foundation was started by Ven, Thupstan Chosgyal, more than a decade back, realizing the never ending medical problems of Ladakhis who live in remote areas. 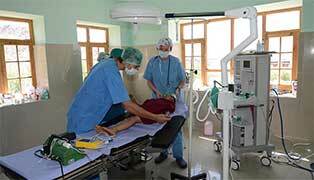 They have been working on health education and medical camps in remote areas. They also aware the people about ten impending of new millennium i.e hypertension, high cholesterol, smoking, obesity leading to diabetes, diet prevention of cardiovascular diseases and cancer, heart attack and sexually transmitted diseases, HIV and AIDS. Their main aim is to prevent the people from environmental, occupational, accidental, mental health and nutrition haphazard. It is involved in construction of medical aid centre in needy areas. Ladakh Heart Foundation Society, Leh is among the twenty-six people selected by Jammu and Kashmir Government for State Awards on Republic Day-2012. Mahabodhi International Meditation Centre was founded by the venerable Bikkhu Sanghasena in 1990 to fulfill its objective of socio-cultural, medical, moral and spiritual upliftment of the people of Ladakh as well as preservation and promotion of their great heritage and traditions. 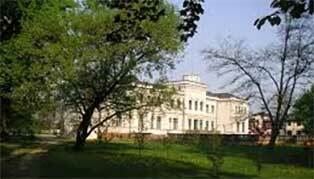 The centre is involved in meditation programme, education, medical, elderly care, nunnery, charity and a lot more. For further information contact: Mahabodhi International Meditation Centre, Devachan, P.O. Box # 22, Leh- Ladakh- 194101, India. 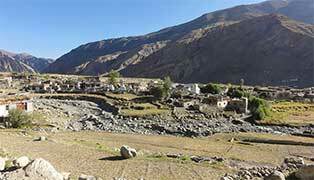 SC (UK) began to operate in Ladakh region after the flood catastrophe in 2010. On the request of local government, SC (UK) provided supplementary nutrition to the children of affected villages in the aftermath of natural disaster. After the relief project of SC (UK), on requests of local/ state government took up Integrated Development Project in collaboration in with ICCW (Indian Council for Child Welfare) and J&K CCW (Jammu and Kashmir Council for Child Welfare) and local administration. SC (UK) was instrumental to create a local NGO called LNP (Leh Nutrition Project).Till 1992 SC (UK) and LNP work together under the same umbrella known as Save the Children/ Leh Nutrition Project. 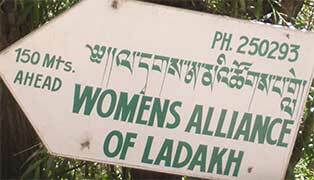 Women Alliance was established in 1991 by local women with the twin goals of raising the status for rural women and strengthening local culture and agriculture. 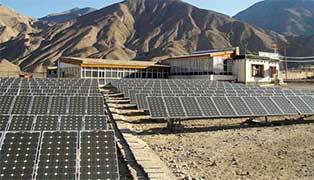 And prime goal of WAL is to strive for sustainable development in rural Ladakh. World Wide Fund for Nature- India (WWF-India) has been working to promote harmony between humankind and nature for over three decades. Its mission is “The Promotion of Nature Conservation and Environmental Protection as the Basis for Sustainable and Equitable Development”. Today, WWF-India is recognized as the premier conservation NGO in the country dealing with conservation and development issues. In Ladakh WWF-India initiated a project “Conservation of High Altitude Wetlands of Ladakh” in 1999. 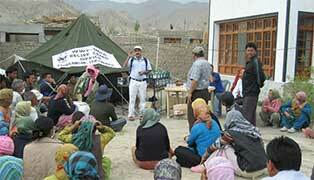 Under the project two field offices- at Leh and at village Korzok near Lake Tsomoriri were established. At present both these offices are actively involved in carrying out various conservation and capacity building programmes. The major activities of WWF-India in Ladakh have been motivating key stakeholders, including local communities, tour operators and defense forces, institution building for conservation, developing communication and resource material, surveys and research. 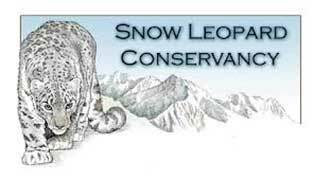 Since its inception in 2000 formally registered in India as an independent organization 2003), Snow Leopard Conservancy India Trust (SLC-IT) has been dedicated to promoting innovative community-based stewardship of the endangered snow leopard, its prey and habitat to the benefit of local people and the environment in the trans-Himalayan regions of Ladakh. 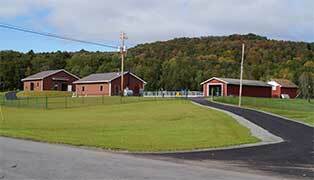 SLC-IT believes that truly sustainable conservation comes from participation by the entire community. Community Conservation Initiatives and Conflict Mitigation in areas where human-snow leopard conflicts are high, and the local communities' suffer heavy losses of subsistence livestock. SLC-IT develops alternative income activities like Predator Proofing, Community based ecotourism, livestock insurance, handicrafts and eco-cafes that benefit local communities and also there retaliatory killings of by local communities are terminated. Environmental Education programs that instill knowledge and appreciation of natural biodiversity and that encourage children to become stewards of wildlife in Ladakh. Research program, in which SLC-IT conducts non-invasive camera trapping monitoring in order to assess the extent to which snow leopard rely upon domestic livestock and number of Snow Leopards in the area. Nature Conservation Foundation, a non-profit organization based in Mysore was founded in 1996 by a team of highly qualified and motivated young wildlife biologists. They are engaged in promoting science-based and socially responsible wildlife conservation in India. Their goal is to contribute to knowledge and conservation of India's unique wildlife heritage with innovative research and imaginative solutions. 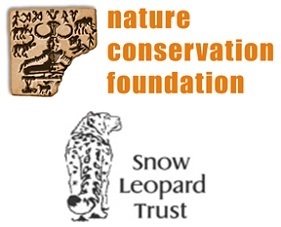 In Ladakh, NCF in partnership with SLT (Snow Leopard Trust) works on snow leopard conservation by working very closely with the local communities. Their project focuses on the human wildlife interface and solutions for peaceful co-existence of the endangered cat with the local communities. We have set up livestock insurance programs to offset the economic loses that local people face due to livestock depredation by wild carnivores. Grazing-free reserves to protect the natural prey populations of the snow leopard has been set up in agreement with the local communities in the Tsaba valley. In Hanle, they have set up a grazing-free reserve with the local community to protect the last population of the Tibetan gazelle in Ladakh. Predator proofing of corrals have been undertaken in several villages in the Central Changthang region to protect livestock from depredation by wild carnivores. Through their education program focusing on children, they hope to create a generation of ecologically aware and sensitive citizens. 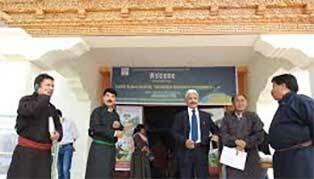 They have formed Himalayan Nature Clubs in schools in Ladakh through which they conduct various in-school activities and expose the children to their local flora and fauna through outdoor camps.